Today's kitchen backsplashes are no longer the simple guardian to protect walls from splatters, splashes and spills. 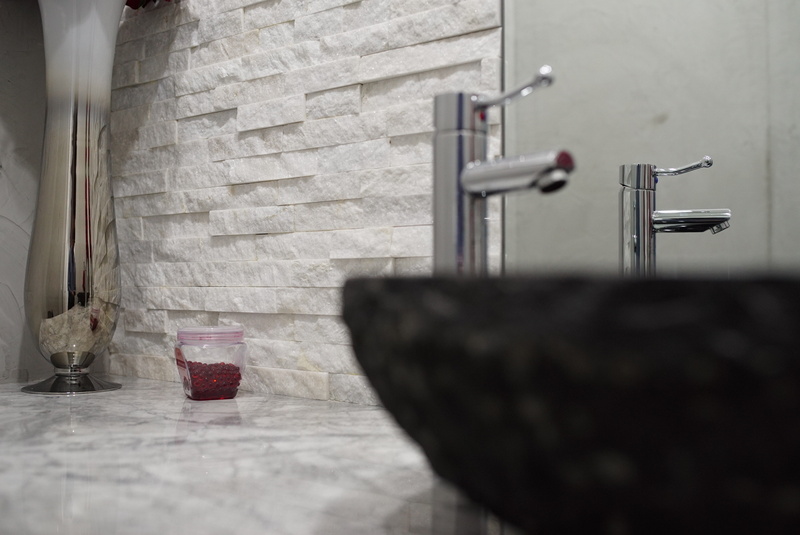 There are a wide array of materials from metal, ceramic, glass, and natural stone. Each material can be the focal point while it adds beauty, texture and depth to your space. From clean minimalist to chic vintage, the style and design options are infinite. What is most important is to choose a style that makes you happy. Do not be afraid to test out unique and outlandish options. Always keep in mind that this portion of the design will be a central defining aspect to your overall theme. 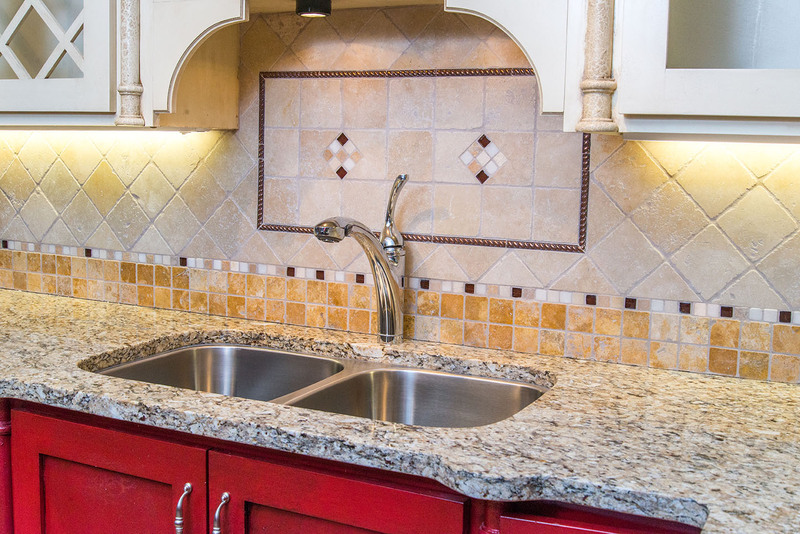 Choosing the proper backsplash to accent your kitchen décor requires several decisions. First, you need to choose the which tile style fits your room's flow. Secondly, you will have to find the pattern or design that will fit your space properly. As we have previously mentioned, you will need to select the tile shape and pattern that will work best in your room design. Then, you will want to choose the perfect material that compliments your choice in design an pattern. The choice of material list ranges widely, from natural stone tiles, metal tiles, glass tiles, ceramic tiles, porcelain tiles, travertine tiles, to subway tile. If your budget and design allows, there are options for granite tiles and marble tiles too. Subway Tiles - One of the hottest backsplash trends, subway tiles are utilized for their classic and clean look. The perfect intersections created by the grout lines give the eye a pleasing aesthetic to latch onto. Diagonal Tiles - If you want a truly unique visual diagonally cut tile can add a visual that will stun your friends and family. The concept of diagonal tiles will modernize your space while displaying your eclectic tastes. Laser Cut Tiles - Patterns and designs can be quite fascinating with laser cut tile backsplashes. The tile shapes offered in this category add design value in the unique visual that is given off by the styling. When you can have pratically any shape imaginable your pattern choices are exponential. 1. Color And Design Blending - You can choose for your tile to match the surrounding décor. As an example a blue tile backsplash would blend seamlessly with gray cabinets. 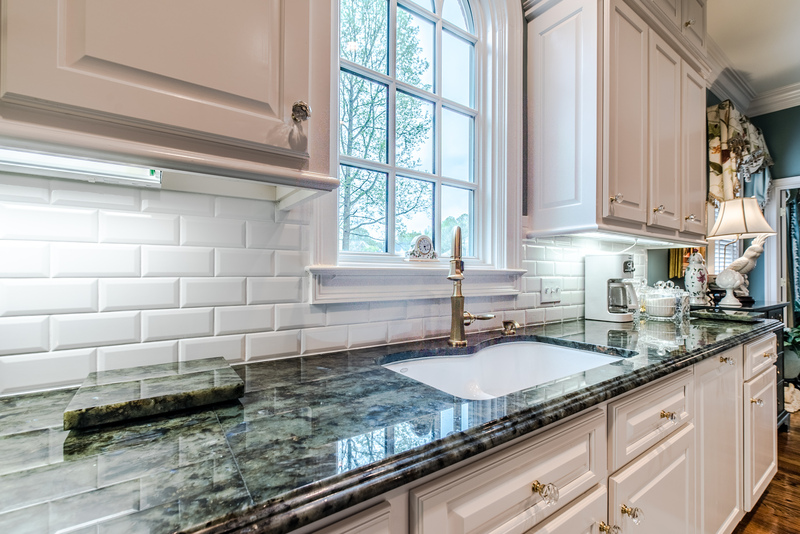 Another classic example to cite would be a white subway tile backsplash with black countertops. 2. Boldly Stealing The Show - You can opt to use a design that contrasts sharply with your surrounding décor. This will make the backsplash its own entity and an essential portion of the overall room design theme. Essentially, you could use the portion of the room's design to grab all of the attention when someone enters the room. 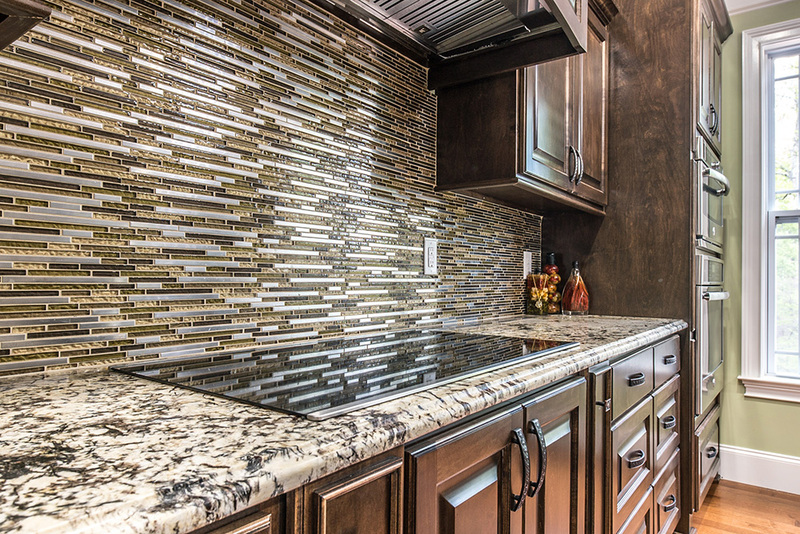 Another big decision you face when installing a custom backsplash will be, the height of the backsplash. This is an important factor that will affect the overall style of your space. 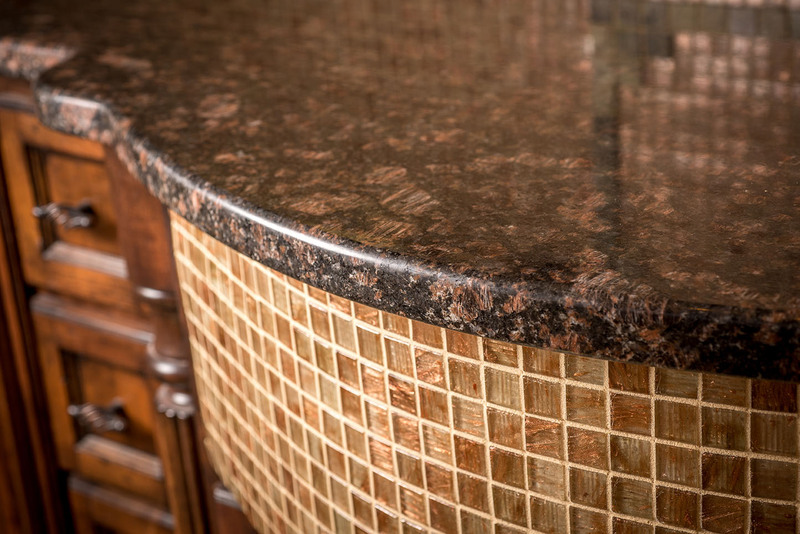 The traditional choice is the normal countertop-to-cabinet coverage. Want to be radical? Then opt for the full height backsplash! This option will create an attention-grabbing focal point in your renovation. Now Let's Dive Into Some Inspiration! 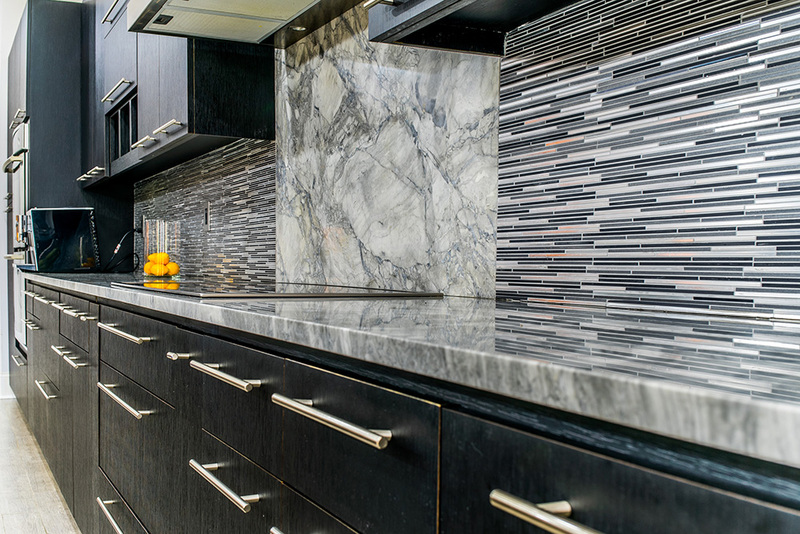 Using this style of backsplash brings a very clean and modern visual to your kitchen. Here the tile backsplash's neutral tones are paired with Super White Marble countertops and Super White Marble cooktop backdrop. This kitchen utilizes the warm earthy tones to create a cozy atmosphere. 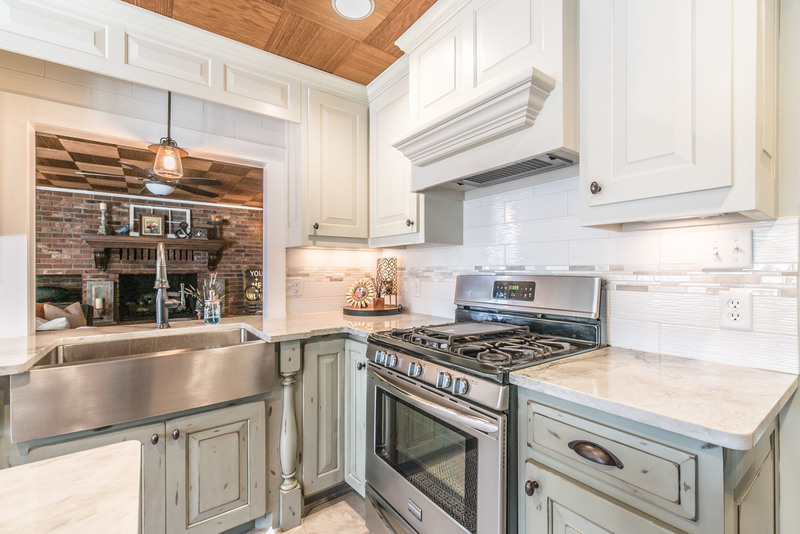 Here the tile backsplash is paired with Delicatus White granite countertops and stainless steel appliances. The stepped pattern continues the natural randomness. White Ledger Panel wall tile is a Natural Stone Slate with elegant white tones. This tile can easily be laid in a pattern or single layout and is suitable for residential and commercial installations. Natural stone products inherently lack uniformity and are subject to variation in color, shade, finish etc. It is recommended to blend tiles from different boxes when installing. 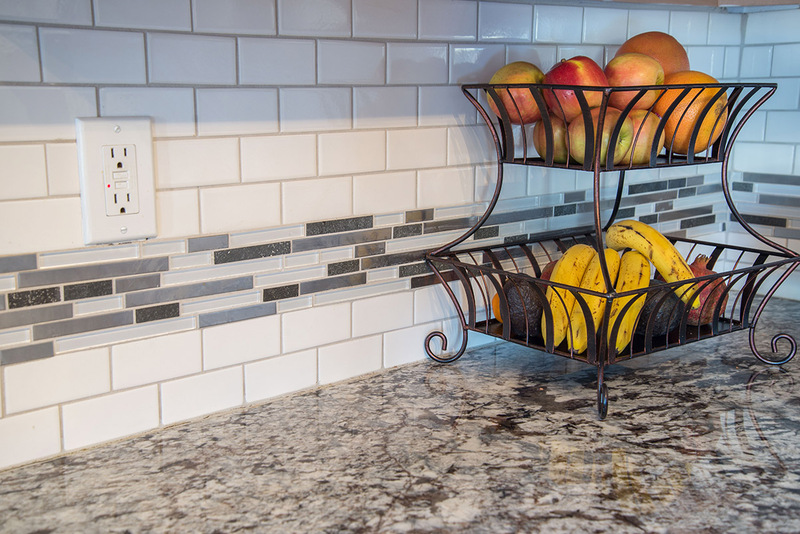 The modern kitchen can utilize The Classic Subway tiles which are a beautiful addition to your kitchen backsplash, shower, accent walls or any other surface imaginable in your home, or office. 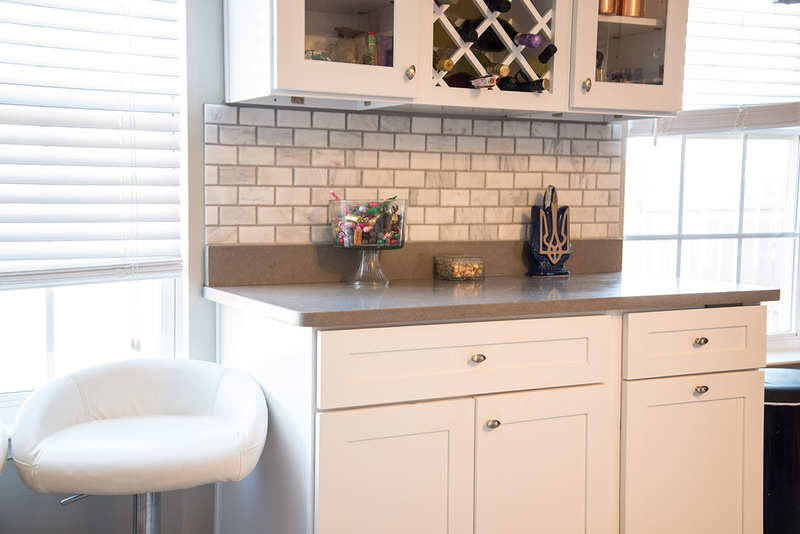 Matte Beveled Subway Tile is subtle enough to work in every room but attracts all of the attention with available detailed finishes like beveled edges and glossy or matte finishes. Expand your room's horizons with this reinterpreted favorite. This mosaic tile is a combination of crystal glass in different colors and finishes as well as copper metal tiles in a subway pattern. It is suitable for kitchen backsplash, bathroom, shower, and feature walls. The beauty of Natural Stone products lends itself to natural variations in tiles. Variations of veining, colors, shade is an inherent characteristic of stone. 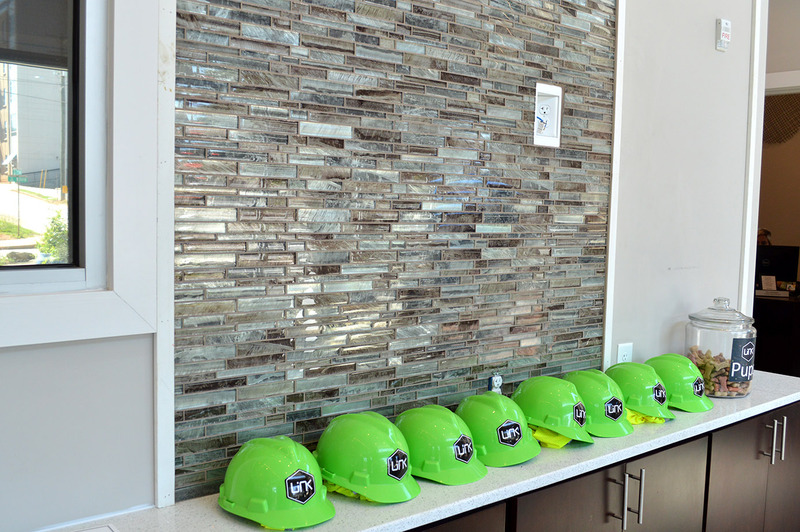 Using the 1x1 Bolero Glass Tile is a great way to insert a pop of color into your rooms decor. Made from small square elements this glossy & iridescent Copper square mosaic tile. This is a great example of modern-day design within a traditional shape. Composed of glass this 5/8'' x 5/8'' tile features an exclusive balance of the material, color, finish and shape. With the pure white subway tile any room will brighten up and helps any space appear larger. Smooth, glossy surface glistens for a polished look in your home and great for backsplashes and feature walls in kitchens and bathrooms. Glass interlocking tile resembles a reflective texture with shades of brown and blue, accented with gray and warmer ranges of color. The narrow, rectangular tiles in a brick arrangement are amazing when used as backsplash tile, especially continued upward to create an accent wall. Carrara Marble subway tile an extremely elegant touch to any residential or commercial space with subtle beauty and smooth textures. Also, this marble subway tile displays the history of Carrera Marble and its historical significance through a visual display of stunning color and texture. With many tile backsplash options on the market it is very difficult to make aneducate decision fast. Which is why we are here for you to help you guide you through the process and answer any questions you have. We pride ourselves on customer service and satisfaction. 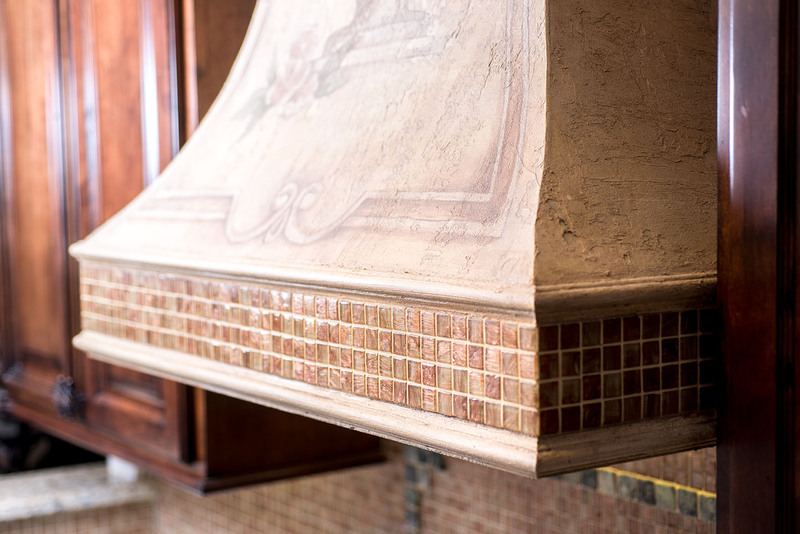 Stop into any of our showrooms and you can see and experience our large tile inventory. 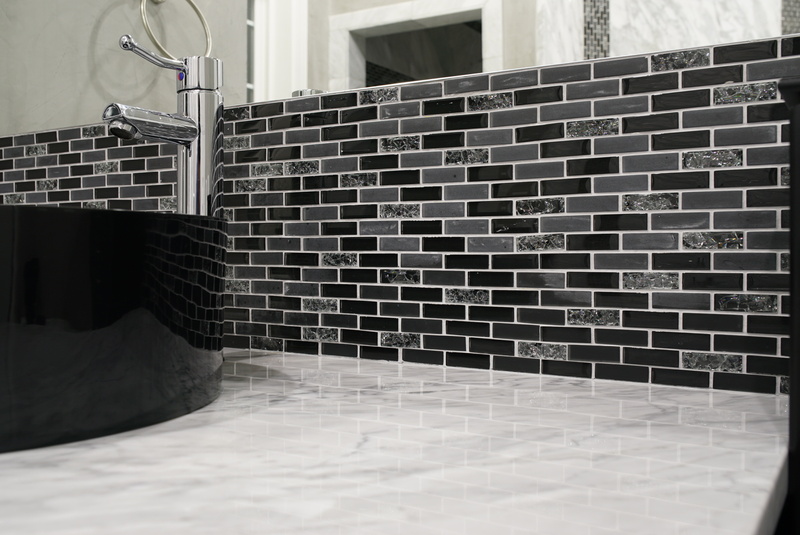 Our tile sales and install teams will inform you of any nuances and issues you might face with your particular project. Our goal is to give you the peace of mind that your job will be completed 100% to your expectations. If you have any questions or concerns please contact us, our Tile Department Manager Deborah would be delighted to help you with your tiling project.